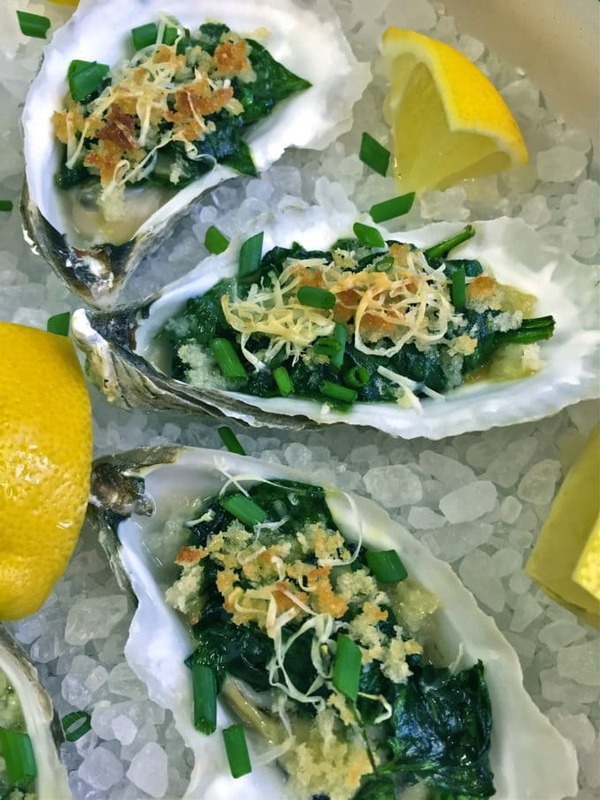 Oysters are for lovers and the Ultimate Oysters Rockefeller is a recipe for romance for an intimate Valentine’s Day Dinner! These little jewels are a delicious and nutritious way to enjoy nature’s bounty and a sweet way to say I love you! 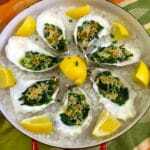 What’s the history of Oysters Rockefeller? Did you know that Oysters Rockefeller was created at Antoine’s Restaurant in New Orleans in 1899, as a substitute for escargot? The story goes that the dish was so rich, that it was named after John D. Rockefeller, who was at the time one of the world’s richest men. The most important component of this delectable dish is fresh briny oysters! And, I am very fortunate to have a friend, Deborah Keller, aka OysterMom, who actually farms and raises oysters in Oyster Bay in Wakulla County. With the help of her family and friends, Oyster Mom grows and nurtures her oysters in baskets, which protect them from predators and allow them to be suspended in the nutrient-rich waters of the Gulf of Mexico. Oysters are natural “ecosystem engineers” for they maintain or improve water quality and clarity, and cycle nutrients throughout the water where they are found. 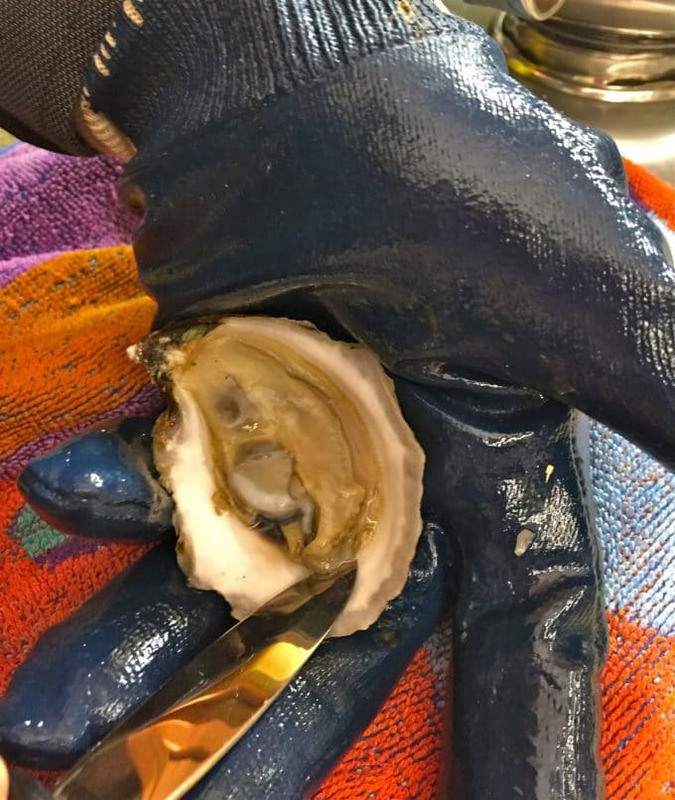 They also assume the characteristic taste and flavor of the surrounding water, the “merroir.” To find out more about OysterMom and her delicious oysters, check out her Facebook Book page. 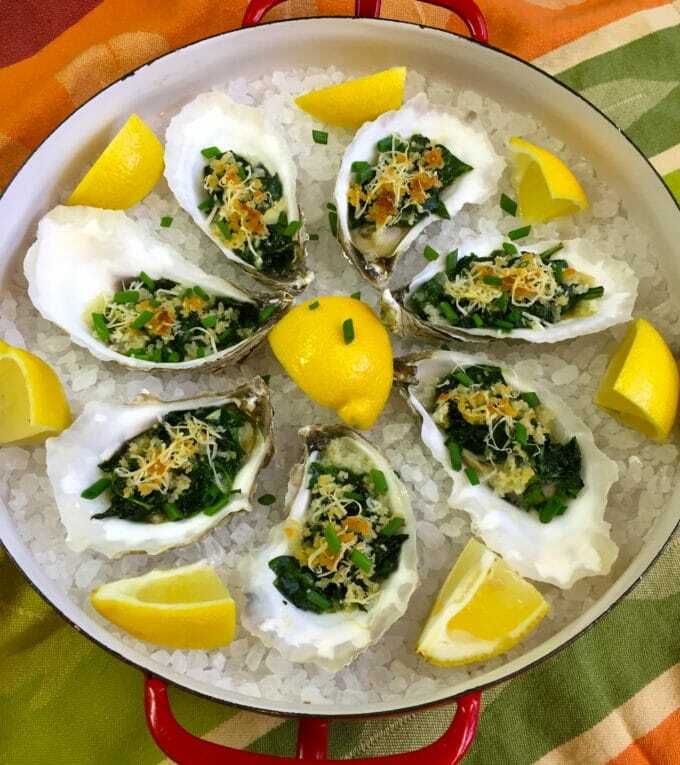 To make delicious Oysters Rockefeller you will need: 2 dozen shucked oysters and shells, butter, garlic, bread crumbs, shallots, chopped fresh spinach, *Pernod, red pepper sauce, olive oil, parmesan cheese, chopped parsley, kosher salt and pepper, and rock or ice cream salt. I was lucky and OysterMom’s sweet husband Jack shucked our oysters. If you don’t know how to open and clean them, I would recommend that you go to a seafood market and ask them to shuck them for you. This part can be messy, especially if you don’t know what you are doing. Are you ready to get started? If so, preheat your oven to 450 degrees. Prepare your baking pan or dish by covering it with a thick layer of rock salt. Arrange your oyster shells in the salt to steady them. First, melt 4 Tbsp of butter in a large skillet over medium-low heat and sauté the garlic for 2 minutes. Watch the garlic carefully and don’t let it get brown or burn. Place the breadcrumbs in a small bowl and add half of the garlic butter. Mix well. Set aside. 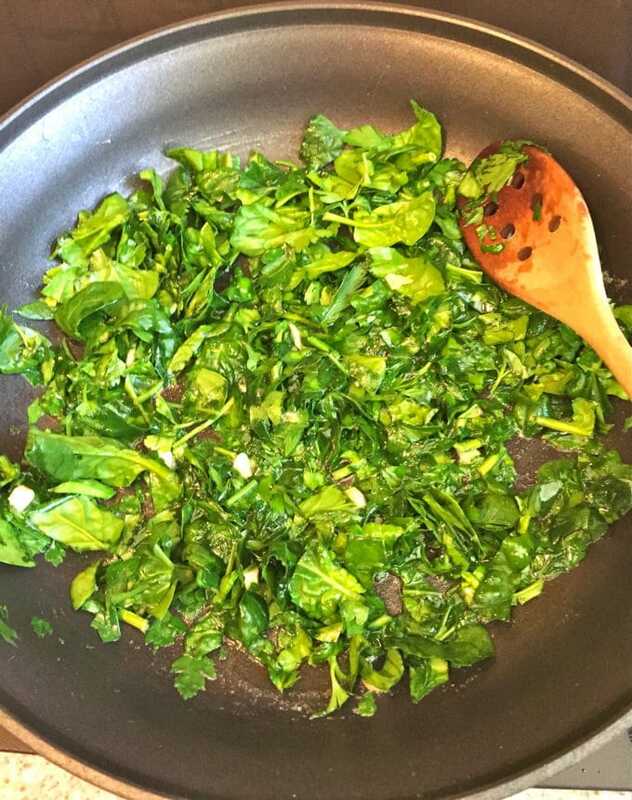 Add the minced shallot, and chopped spinach and parsley to the remaining garlic butter in the skillet and sauté for about 3 minutes, or until the spinach wilts. Deglaze the pan with Pernod. Add a dash of red pepper sauce and season with salt and pepper. Allow the mixture to cool slightly. To the breadcrumb mixture add olive oil, and Parmesan cheese and mix well. Season to taste with salt and pepper. 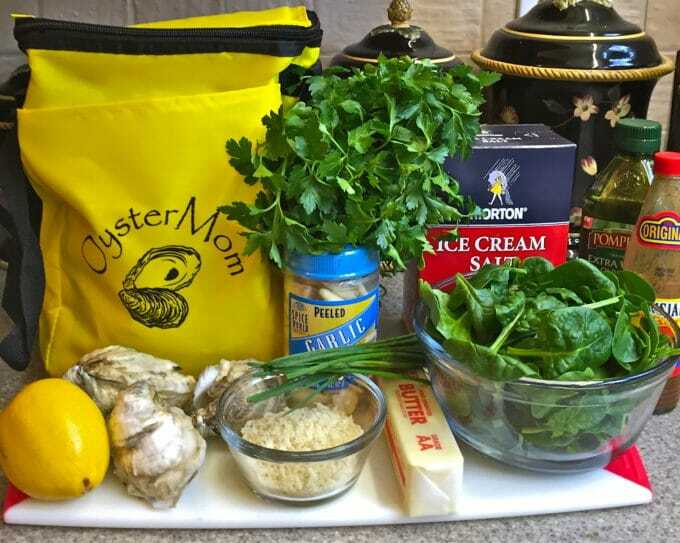 Top each oyster with 1-2 heaping teaspoons of the spinach mixture, followed by a spoonful of the breadcrumb mixture. Bake, the oysters for 10-15 minutes, or until the breadcrumbs, are golden brown. Serve on the rock salt, with lemon wedges. Pernod is an anise-flavored liqueur. If you have some great, but if not, you can use vermouth or a sweet wine. If you don’t have rock salt, you can use a muffin pan or Madeline pan to hold the oysters. The object is to hold them steady while they are baking. 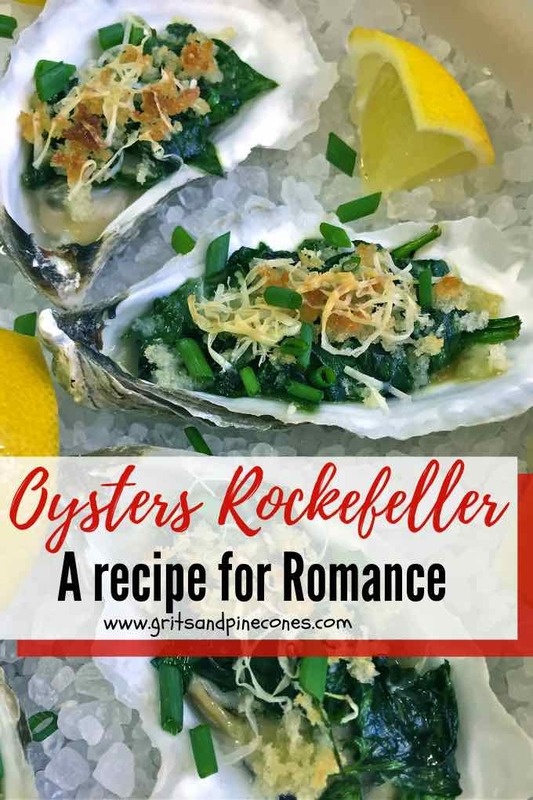 Oysters are for lovers and delicious Oysters Rockefeller is a recipe for romance for an intimate Valentine's Day Dinner! These little jewels are a nutritious way to enjoy nature's bounty! First, melt 4 Tbsp of butter in a large skillet over medium low heat and sauté the garlic for 2 minutes. Watch the garlic carefully and don't let it get brown or burn. Add the minced shallots, chopped spinach and parsley to the remaining garlic butter in the skillet and sauté for about 3 minutes, or until the spinach wilts. Bake the oysters for 10-15 minutes, or until the breadcrumbs are golden brown. Hey, did you use the recipe from Thymes Remembered? If so that was another of my mothers recipes that I submitted to the book. She had had them at Antoine’s many times and just had to duplicate it. The Pernod is a nice added touch. When Walter and I were dating she would make this for him all the time, he loved them. Sitting them on a bed of salt IS very important because the steam from the salt permeates the oysters and mixture. I didn’t use that recipe, but did look at it and it looked delicious! Your Mom must have been a fabulous cook to have so many wonderful recipes! You must take after her! There are no more loved oysters grown anywhere, and you have added another layer. The stuff of dreams…….. These oysters look yummy. My husband is the real oyster eater, but then he loves to stand out by the grill and eat them as they pop open. Thanks for adding your flair to the Thursday Favorite Things Blog Hop! This post has also been pinned to our group board. Thanks so much Shellie! By the way, I love your Blog! I’ve never tried this dish with watercress, but I’m sure it would be delicious. Next time I make it I’ll give it a try! 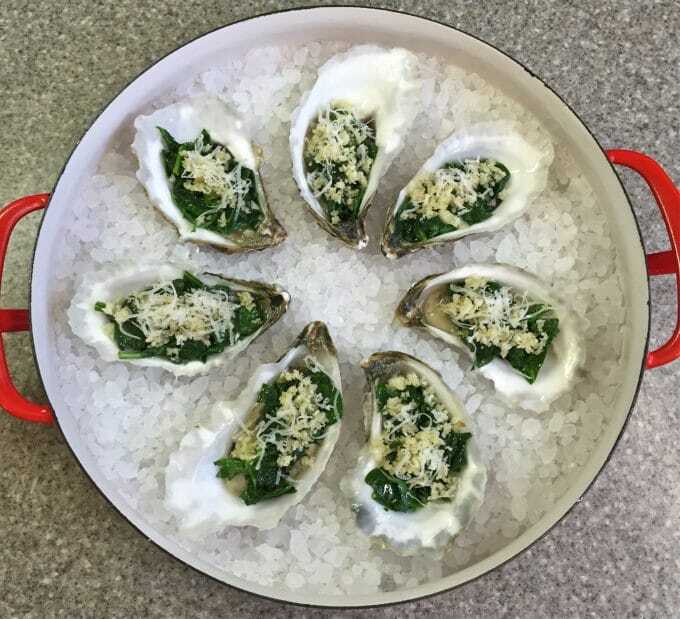 I found your Oyster Rockefeller recipe online and decided to try it, and I was not disappointed. Five stars! I didn’t have the Pernod, so I used the suggested dry vermouth, and instead of a shallot I minced a red onion. I shouldn’t have worried. The results were beyond outstanding. I liked it SO much, I’m serving these tonight as the main course for a dinner party. Thank you for sharing your recipe! Hi Cathy, thank you so much for taking the time to share your sweet comment! You made my day! I hope your guests enjoy them too!